Many industrial processes that were once steam heated, are now direct fired; space heating systems in large industrial facilities are moving away from steam. Old steam boilers are very inefficient at low load factors. Yet some industrial processes still require steam. These are all reasons to consider a steam generator. Steam generators are like boilers in that they are fired by gas and produce steam, but they are unlike boilers in that they do not have large pressure vessels and are made of light-weight materials. The fact that they do not have pressure vessels means that in most locations they do NOT require a boiler operator (always confirm with local codes). This can be a substantial savings when there is no other reason to have an operator other than the local code requires it for a pressure vessel. The fact that they are made out of light weight materials means they perform well at part loads and respond quickly to changes in loads. This greatly increases part load operating efficiency. Steam generators cost about 50% more for the same horse-power output, so there must be some efficiency or operational gain to justify a steam generator over a conventional steam boiler. Steam loads with a high load factor boiler do well with conventional steam boilers. 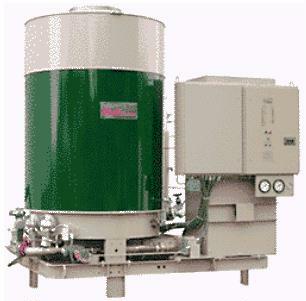 The best applications for steam generators are where very large steam boilers are still used in a very low load factor application, such as during the summer months to supply a small steam process when there is no other load on the boiler. Also, eliminating boiler operators from a relatively small boiler house (if union and code allows) can be a substantial operating savings. 4213 North Temple City Blvd. The Clayton Steam Boiler line uses a small footprint package in a vertical arrangement to produce steam up to 500 psi. The boilers are also lighter than older, cast iron type boilers, as the steam coil is copper tubing arranged around a circular, high velocity fire chamber. Standard efficiency boilers are available in 20 – 600 hp and higher efficiency boilers are available 150 – 600 hp. Boilers can be modularized to fit any size need. Boilers are factory run and arrive at the site ready to be put into service, saving installation labor and time. Literature says average installation saves 100 sq. ft. per boiler. Entire boiler package is skid mounted for installation anywhere, including outdoor applications. Boiler has low mass, so there is a faster heat up time, and smaller standby/jacket losses than large cast iron type vessels. Literature claims cold start to full head of steam in 5 minutes, that can be repeated several times per day for years without deterioration. Efficiency rating at 100% capacity is 85%; at 25% capacity is 84%. The heat transfer in a Welden steam generator is direct from the products of combustion to the water, because of this fact, the efficiency never diminishes regardless of scale build-up. Too much scale build-up would restrict the steam flow but never the efficiency.